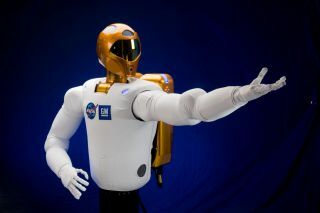 NASA's Robonaut is just one of many real world robots that help astronauts in space. Robots in space aren't limited to science fiction: NASA has a long list of robotic technologies currently operating in orbit and benefiting humans, even though astronauts don't yet have anything like a trusty R2-D2 bleeping comments and questions. The space agency recently released a list of robotic technologies already in use on the International Space Station, ranging from complex robotic arms to humanoid helpers. On Earth, some of the Canadarm technologies have had medical applications. For instance, a device called neuroArm can make brain surgery more precise, and the Image-Guided Autonomous Robot targets tumors. Astronauts are also working alongside Robonaut 2, a dexterous humanoid that is designed to flip switches and do other simple, monotonous tasks so that astronauts can focus on more difficult things. In the future, Robonaut could take on tasks that pose a danger to astronauts, or even administer medical care to injured crewmembers (while being directed by a human back on Earth). Eventually, NASA wants to adapt a version of the robot to do spacewalks, and a next-generation version of the Robonaut, called R5 or Valkyrie, could even travel to Mars ahead of humans. In the meantime, the Robonaut can dance a pretty good waltz. Yet another new robot technology makes it possible for someone in space to control a rover that is on Earth. Both the European Space Agency and NASA asked astronauts to test out rover driving from space to assess the possibility of one day having astronauts in a spaceship drive rovers on the surface of the moon or Mars. This could save the expense and hassle of a human landing mission, leaving the people up above to do the driving while the robot below takes the brunt of the risk. ESA astronaut Andreas Mogensen and the Eurobot, which is designed so that astronauts in a spaceship can control it while it's on the surface of a planet or moon. It's one of many robots already working in space. Another robotic helper just arrived at the station, too: The ISS External Ammonia Leak Locator was shipped on a Cygnus spacecraft that arrived this past weekend. The robot is designed to look for ammonia leaks — a task that usually requires astronauts to take on risky spacewalks. They may not be as talkative as C-3P0, but these space robots are a valuable part of life in orbit.